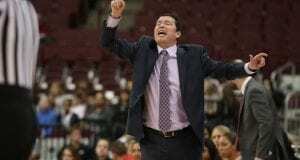 Following an 88-79 exhibition win over the Ashland Eagles on Sunday, Ohio State women’s basketball head coach Kevin McGuff was not shy about voicing his displeasure with his team’s performance. “We had an overall lack of focus and effort that was disappointing, quite frankly,” McGuff said. He also said Ashland did a great job of executing throughout the game and praised the opponent for sticking to its game plan. After Ashland claimed the opening tip, it was a back-and-forth contest for most of the first quarter. Ashland pulled it to within one at 22-21 with 1:34 remaining in the first, but an 11-0 run by the Buckeyes put the score at 33-21 early in the second. OSU took a 47-36 lead into the half, but a 9-3 Ashland run to begin the third put the Eagles within five at 50-45. OSU would then use a 17-4 run to claim a 67-49 lead early in the fourth. The Eagles used one last push to slowly chip away at the Buckeyes’ 18-point lead. 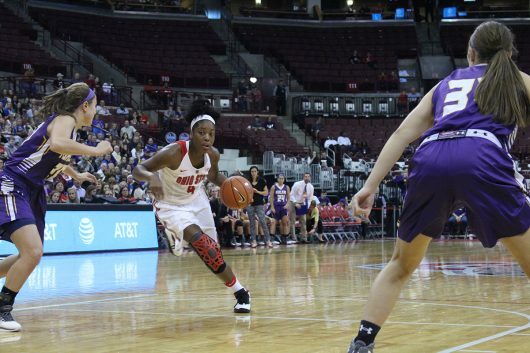 Ashland brought it to within six at 82-76 with 2:06 left before OSU closed out the tight win. McGuff said that the Buckeyes displayed much more effort in a recent closed-door scrimmage. 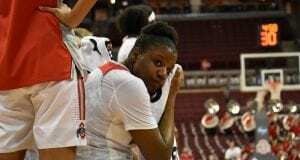 This offseason, senior forward Shayla Cooper said that OSU’s depth would allow her to slide into a more comfortable role. At times last season, she had to play in the middle due to depth issues. On Sunday, Cooper looked more like a guard than a forward. “It was stuff that I worked on all summer, so I was glad to be able to put it to test,” Cooper said. The 6-foot-2 forward brought the ball up the court to set up the offense on several occasions as well. Cooper finished with a team-high 20 points on 7-of-10 shooting. She added four rebounds and four assists in 24 minutes. Of OSU’s 88 points, 42 came from three new additions to the Buckeyes’ roster. Redshirt junior transfer Stephanie Mavunga (previously at North Carolina) led all newcomers with 18 points on 7-for-12 shooting and a 4-for-4 mark at the free throw line. The forward added eight rebounds and a team-high five blocks. Redshirt sophomore guard Sierra Calhoun, a transfer from Duke, tallied 12 points on 4-of-10 from the field. True freshman Kiara Lewis put up 12 points on 4-of-4 shooting and buried both of her three-point attempts, but she went just 2-of-10 from the free throw line. Freshman guard Jensen Caretti also saw the court, but she was 0-of-1 from the field in 10 minutes. Junior guard Kelsey Mitchell, who was voted as the Big Ten’s Preseason Player of the Year, couldn’t find her shot on Sunday. She went just 5-of-20 from the field and missed all eight of her three-point attempts. Of OSU’s 88 points, 77 came from players other than Mitchell, something that likely would have not happened with last year’s team. “That’s the beauty of this team, is we have a lot of offensive weapons,” McGuff said. 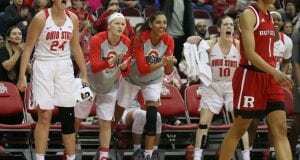 OSU will tip off its regular season on Nov. 1 at noon against Duquesne at St. John Arena.